Even pros hook the ball. 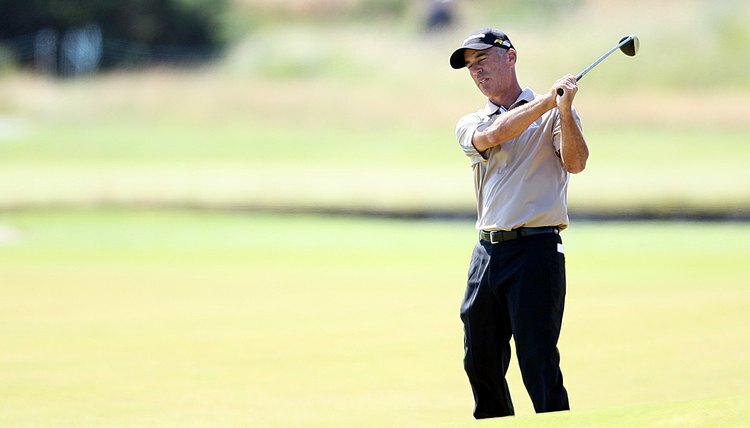 Corey Pavin hooks his second shot out of bounds during the 2010 Senior Open Championship in Scotland. A right-handed player’s hook is a shot in which the ball moves right to left because of sidespin created when the golfer hits the ball. You can hook the ball with any club, including fairway woods, which are generally used for second shots on long par-4 or par-5 holes. In either case, hooking a fairway wood leaves you with little chance to hit the green in regulation. Golf professionals offer several common remedies to correct a hook. Correct your stance. All-time PGA Tour great Billy Casper advises golfers trying to cure a hook to open their stance by moving their front foot back slightly, relative to the target line. Golf instructor Paul Trittler suggests checking your stance at address to ensure that your body isn’t aimed to the right of the target (for a right-handed golfer). Weaken your grip. PGA professional Jay Golden says the main cause of a hook is the golfer’s hands turning over too soon, meaning the right hand rotates on top of the left (again, for right-handers) prior to impact. To weaken your grip -- or to rotate it into a neutral position -- Casper says to make sure the left thumb points straight down the shaft, rather than pointing to the right. Newell says that if your grip is too strong you’ll see all four knuckles on the back of your left hand when it’s positioned on the club, rather than two or 2 1/2. Improve your hip rotation. In his book "The Complete Golf Manual," Steve Newell says that players who hook the ball typically slide their hips toward the target during the downswing, rather than rotating their hips to the left. Trittler agrees that players must clear their hips by rotating them prior to impact, to give their hands a clear downswing path. Correct your swing path. Golf instructor Matt Killen says the faulty in-to-out swing that often causes a hook can be corrected my maintaining the same spine angle, relative to the lower body, throughout the swing. He suggests taking an old golf shaft or similar object to a practice area and sticking the shaft in the ground just beyond the ball (from the golfer’s point of view at address) at a parallel angle to the golf club in the address position. To hit the ball without striking the shaft a golfer must keep his hands low, thereby maintaining the same spine angle. Stop the Ball From Going Left When Driving in Golf?